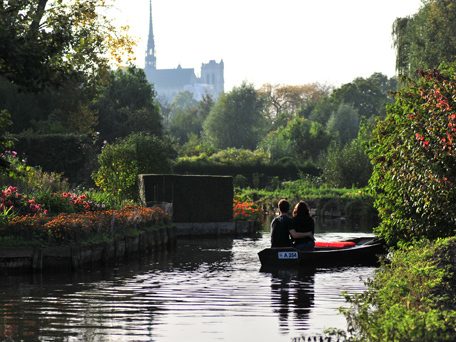 Also unique to this compact city are the hortillonnages – floating market gardens in Amiens (between Paris and Lille) that have been cultivated since the Middle Ages. Wandering along the towpaths of this network of minuscule canals, or exploring them by traditional boat, is one of the highlights of a weekend in Amiens. If you can tear yourself away from one of the cosy hotels or B&Bs that characterise Amiens, early Saturday mornings see the city’s water market on the canals of the hortillonnages – a great opportunity to sample regional specialties including ficelles picardes (oven-baked savoury pancakes) and macaroons. In April (and October), foodies will also delight in the réderie or fleamarket, with local produce stalls alongside stands selling retro furnishings, vintage records and more.